I was really interested to get as compact an implementation as I could of an interactive speech app such as Jasper or Alexa, using Rpi Zero and a built-in mic and speaker. 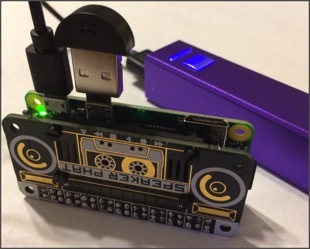 I had a Pimoroni SpeakerPHAT laying around from earlier playings-around, and that seemed perfect for the task. Here's what I ended up with, and while I'm just using my USB battery here, to make things more compact I could equally use the flat battery listed in my Jupyter/Rpi page. USB battery such as this one ($15). As with previous Raspberry Pi Zero models, there's still a buy-only-one-at-a-time rule, and since Murphy's Law suggests you may lose one to a mistake you may want to buy one or two extra Zero's via these other stores: Pimoroni, Canakit, and The Pi Hut. Starting with the punchline first, here's a 1-2min video in which I'm playing with / demonstrating how (and how well) Jasper works on there. Being used to hearing Siri and Alexa and Google's agent has me sortof spoiled in terms of expected level of quality - this thing is open source, is a community effort, can be installed entirely locally and is pretty configurable/personalizable; and for all that it's pretty neat. But it's no Siri or Alexa or Google agent by any means. No judgement meant toward the developers there, I still think it's really neat.